TVR Communications was originally known as the TV Rental Company. Based in New York, their business involved carrying televisions into patient's hospital rooms, collecting the cash, and picking them up days later. But they outgrew that model, and begun developing an Interactive TV model in which patients could access the Internet, email, games, movies and music through the TV in their room using the handheld pillow speaker. TVRC was on the prowl for a new "Big Time Marketing Agency." They needed someone to meet their temporary needs for about 3-4 months while they looked. 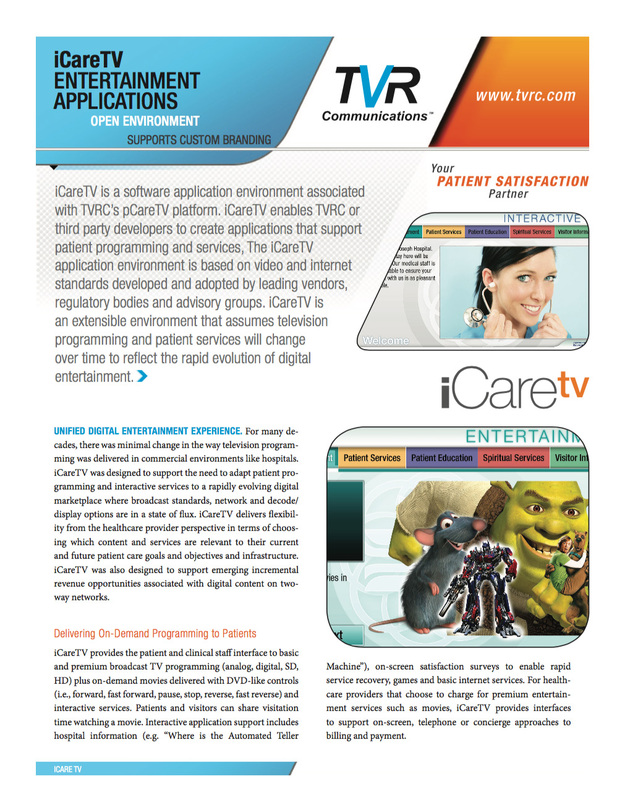 I ended up doing acting as their "big time marketing agency" for the next 3 years, meeting all their needs, including designing custom interfaces for their Interactive TV platform for 4 hospitals. To start off, they just needed some new business cards. Then a side-table flyer for a number of hospitals. They loved the treatment I made across the top of the flyer! As I continued to work on more pieces, this header became the core elements of all future marketing materials – from advertising and flyers to direct mail (seen here) and digital assets. With several deliverables under my belt, the time came to design a look for their website. I improved upon the initial header I had created, and bolstered the color along with depth and textures to create a new look. The client was pleased. After creating the look of the website, I carried over the top header to their other collateral pieces. 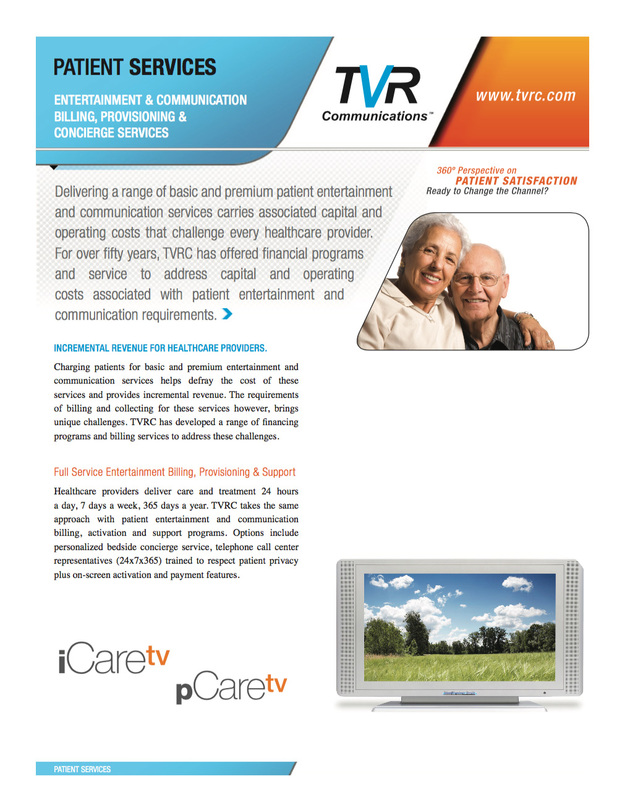 I created a series of about 8 white papers covering their different platforms and services, including their iCareTV and pCareTV services. TVRC needed a handful of vertical signage pieces for tradeshows. Signs were kept clean, simple, using the angles developed for other pieces. 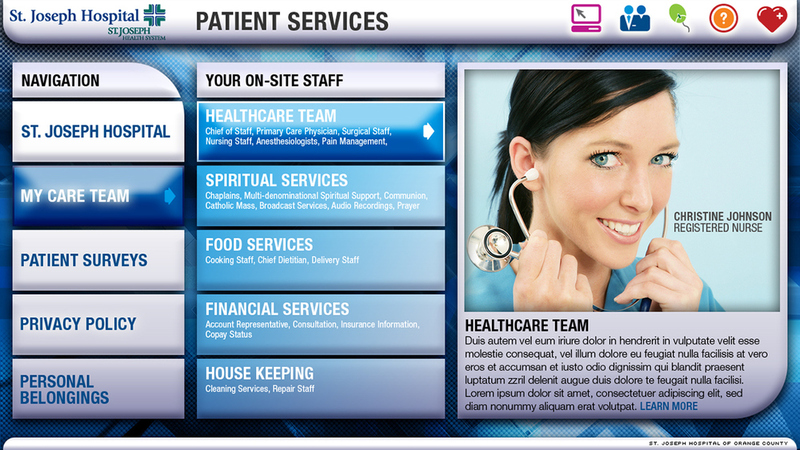 Designed dozens of interactive, multi-language screens for hospital applications. Interface accessed and controlled through pillow-speaker remote. 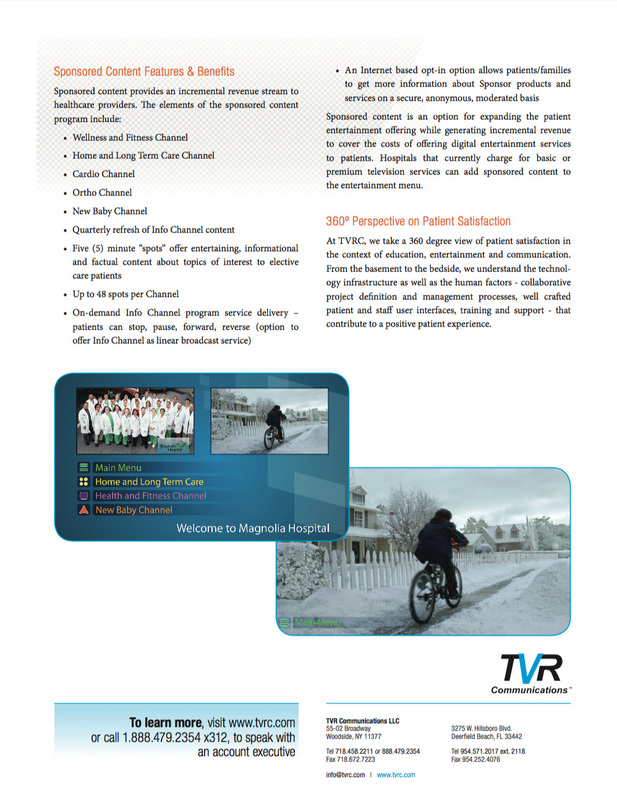 (3 screens from 2 hospitals shown). I also worked on an interface for a Children's hospital running 4x3 aspect ratio televisions.